Wamika Customized Stainless Steel Vacuum Insulated Water Bottle, 13oz. Thermos vacuum insulation technology that locks in the temperature and freshness of your favorite beverage. The thermos bottle has a specially-designed PU leather exterior, which makes the vacuum beverage bottle more unique and stylish. Worry-free service: 24-hour customer support, 30-Day Money Back Guaranteed! 1. Material: Stainless steel bottle body, Food grade PP (BPA free), PU leather cover. 2. Dimension: 2.36D x 10.24H inch. 4. Placeable position: standard automobile cup holder, bike rack or hiking backpack side pocket. 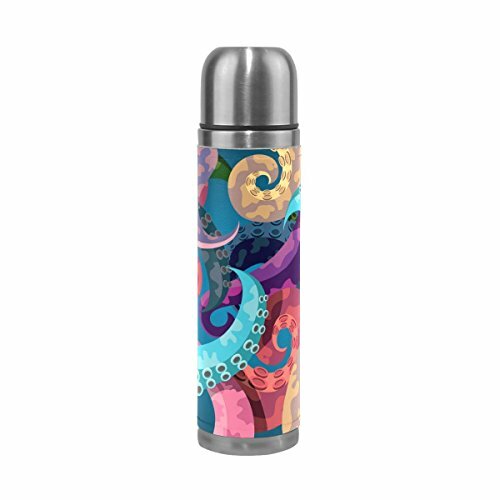 ◆Constructed with double wall stainless steel, Non-tail high vacuum brazing technology, The inner shell increases the copper plating process, make it possible to keep beverages hot for 12 and cold for 24 hours. ◆The beverage bottle comes equipped with its own built-in, insulated stainless steel serving cup, so there is no need to pack an additional cup. ◆Close or Press construction and rubber gaskets keep this bottle leak-proof. ◆The exterior covers COW SPLIT LEATHER that makes you feel good texture when you hold the stainless steel bottle. ◆Nano printing technology makes the leather printed cover looking cute and attractive. ◆Thermal Insulation lifetime long for 8 years. Capacity: 13 ounces or 500 ml(10.24"h x 2.36"diameter). Material: Insulated stainless steel,18/8 food-grade PP, PU Leather exterior, non-toxic, BPA free. for heath-safety and eco-friendly.